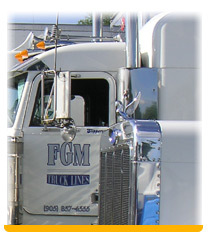 Our professional team of certified and qualified drivers and staff at FGM Trucklines. People, make the difference...and FGM Truck Lines is proud to employ the best in transportation professionals. Our people behind the scenes at FGM are just as important as our drivers on the road. They work as a team to provide the efficiency that maintains our competitive advantage. Speed in communications is essential in the trucking industry, and at FGM we are constantly increasing our IS department and information network to keep up with the expanding technologies we use.These technologies and the people that manage them help make FGM Truck Lines one of the premier transportation companies. We team our Dispatchers and Customer Service Representatives for specific territories, so they really get to know your individual needs. At the touch of a button we can access information on traffic and equipment, provide you with accurate "cost effective" estimate, tell you the exact location of your load, or find the truck or specialized equipment you need for your priority shipment NOW! You can count on every aspect of FGM equipment to be in the best possible condition. Our skilled mechanics have the knowledge, experience and facilities to keep our equipment running smoothly, assuring the safety and delivery of you loads. Our drivers meet very strict qualifications. We hire only the best drivers and because of this they make FGM Truck Lines one of the safest truck fleets on the road today. We are proud to be in the 10 % group of the safest fleet in Ontario. FGM acquired an excellent audit rating in the last MTO audit. Only 10% of all fleets in Ontario receive such a rating.